2- You have no more accent problems. You can write in Chinese and Arabic. 3- You can add and remove any elements html on the screen: divs, images, texts, input fields, textareas, etc. 4- You can to resize the canvas and any element. 5- You can drag the canvas and any element. 9- The possibilities are endless. Open a URL in same or other tab of browser. And not is blocked as a Popup. Returns: Either "nothing" for an action block or the value it returns if it's a normal block. Example: Open "Google page" in same tab of browser when mouse is pressed. Change the CSS properties of any page element. Example: Set background color of body page to black. Example: Centralize horizontally the game canvas in page. Insert CSS code on the page. 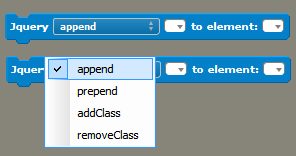 append: Add a new element on the page after the last element. prepend: Add a new element on the page before the last element. addClass: Add a Class to a element. removeClass: Remove a Class of an element. Example: Append an element Div with text to element ID: #openfl-content. 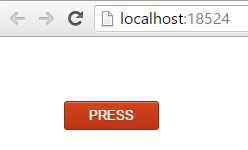 Example: Add Class "myButton" to element ID: #button1. Example: How set the style of button. 3- Insert the style code in page. Example: How set the events of a button. 18/07/2016 - Block: open URL in this page. - Implement open in new tab without blocking. - Block: open URL in this page. Allow only one click. Applied the extension, it working fine. in which we can't open any link because it is blocking. But without links we can't to add sponsor branding, site. So everybody must have this behavior to be able to sell web games or promote their web games. Nice. I update a new version now with all types of target. i tried different options, but it looks that all options working the same(except blank, that simulate usual open URL block), what is the difference between them? Truth. I also did not notice the difference. Open URL in browser in the same window. Open URL in browser in another window. Now open the same and in another tab of browser without blocking. It is best to open in another tab of browser of that close the game. Because, the player can click unintentionally. 1- You can use Google fonts. 9- Thus Stencyl becomes better than Construct2 to games Html5. It is already working here. But need edited the template HTML of Openfl. It's a lot to explain. I explained only the main. 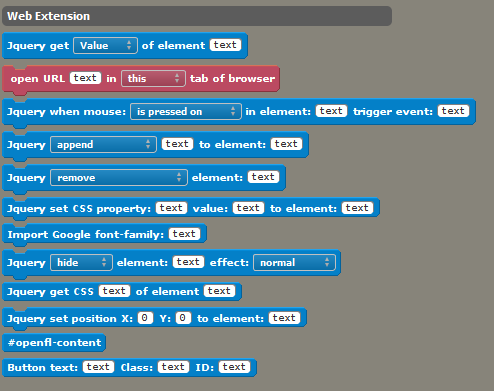 To use all the possibilities of this extension the way is to study CSS and HTML . 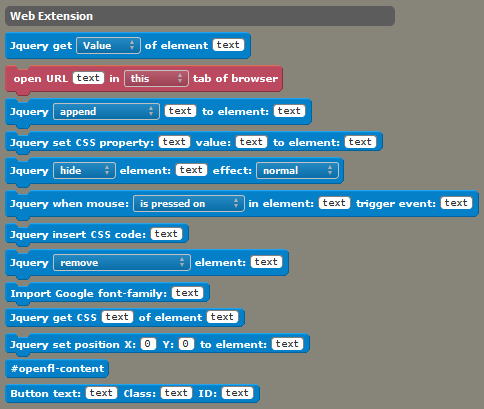 Web Extension 4.0 was launched. For games that do not require physical the performance of DOM is better than the Canvas in some cases. - Work in every browser without problems. - DOM doesn’t have to be updated and redraw inside the animation loop and doesn’t slow down the FPS. - Perfect for UI, texts, inputs, scrollbars, etc. - Good to manipulate pixels or particles. - The larger the screen and objects, worse the performance. - The more and larger actors, worse the performance. - Bad for UI, texts, inputs, scrollbars, etc. - SVG images do not lose quality when resized. - SVG images make the game assets lighter. 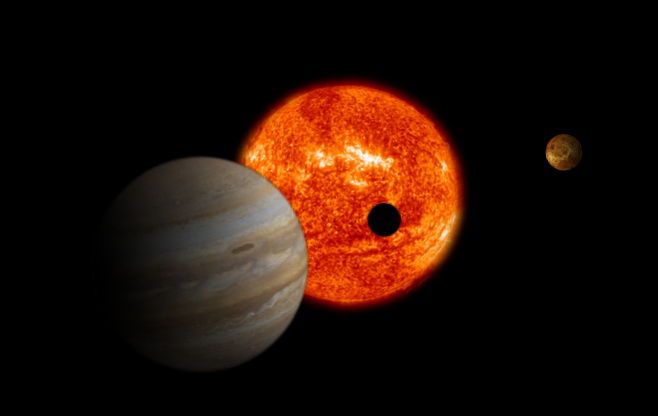 - Bitmap images lose quality when resized. - Bitmap images are heavy. - SVG bad to complex images. - Bitmap good to complex images. Awesome! Such a good extension ! !